ONCE upon a time you'd avoid Melbourne's laneways. The city was a labyrinth of these small connecting passages between the major streets, mostly poorly lit and frequented by denizens of the night, with dark and desperate goings-on that a new arrival shouldn't know about. There were some mysterious alleyways behind my office on La Trobe St on the CBD's edge you were advised not to linger in after dark. So informed, I kept to the main thoroughfares. What a change has taken place. The cobbled laneways of Melbourne are now a famous tourist attraction, with visitors from all over Australia and the world ... especially after dark. Even the famous covered arcades, which were always a cut above the outdoor alleys, have been refreshed and are heaving with trendy cafes and boutiques of all kinds. 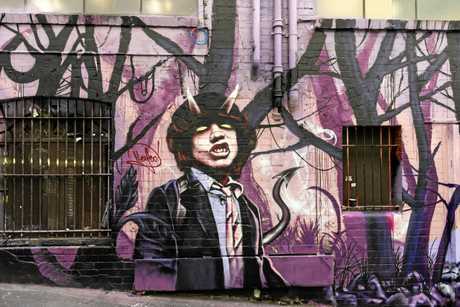 What has brought the laneways so much attention? When you consider Melbourne's so-called "conservative" traditions (remember the six o'clock closing?) it seems that about 25 years ago a new generation started something of a rebellion against conformity coupled with an interest in reviving the dying heart of the city. Young entrepreneurs (and, it must be said, the city council) saw the potential to capitalise on the potential of abandoned warehouses and a variety of architectural styles. Regulations have largely deterred large-scale demolition and development thanks to groups such as Melbourne Heritage Action. Meyers Place, a small bar that opened in an old warehouse in 1993, was an inspiration for the new grungy, recycled design aesthetic that spawned a new Melbourne CBD culture including the acceptance of graffiti as a decorative attraction. 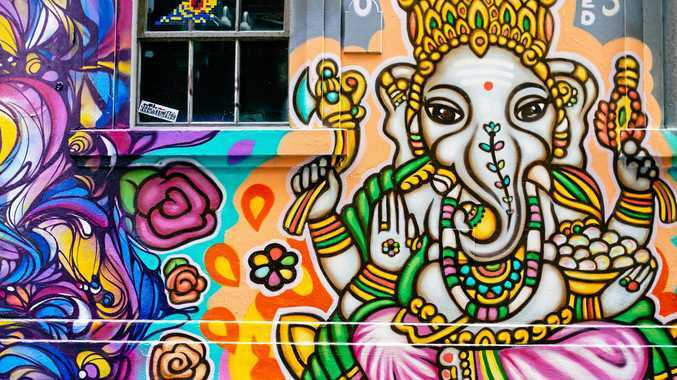 It's now called "street art" and this is the emblem that's most featured in tourism promotions, walking tours and Instagrams that define the city. For a photographer, colour is the drawcard and on fine weekends (yes, Melbourne has its fair share of those) the laneways are filled with jostling selfie posers as well as the serious tripod crowd. The cafe, bar, restaurant and music scene is evidence of a completely new Melbourne vibe and there are now boutique hotels in buildings that were neglected for many years. An example of quirky individuality that reflects the colourful laneways can be found at the top of Little Bourke St, just around the corner from the Princess Theatre. 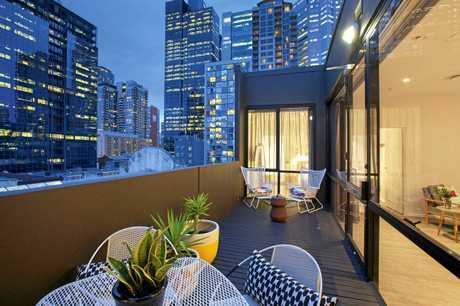 This is the Ovolo Laneways Hotel, a 42-key property in an old building carefully refurbished in 2012. General manager Amy Moylan is a big fan of the area. 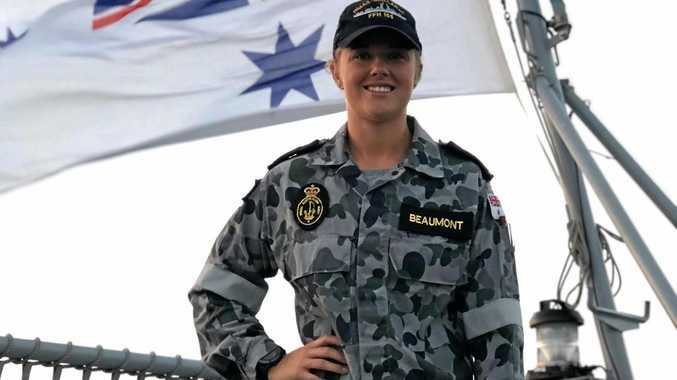 "I'm inspired daily walking past the street art, eateries and ever-changing new options for visitors to explore the city on foot and find hidden gems around every corner," she said. 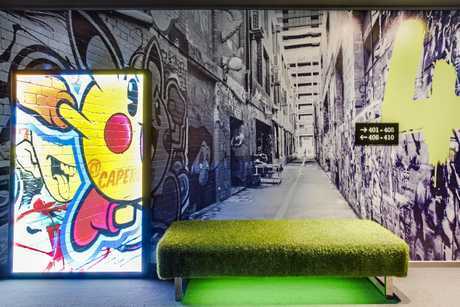 The hotel designers had to challenge the limitations of the site in a creative way, using artwork that reflects the laneway ethos with fun and irreverence. Ovolo has added value offerings like an iPad and free minibar in every room, free happy hour drinks in the lobby and a cute goodie bag to take home. There's no restaurant, but breakfast is free and available on the top floor terrace with toasties, croissants, cereals and pastries plus tea/coffee. It's also a good place to meet with other guests and compare notes ... everybody has their favourite laneway story and photos to post. 1. Meyers Place, the bar which started the trend, has relocated to new premises in Crossley Lane but it has a worthy successor in the same location called Bar Carlo, below a very old favourite Italian trattoria of mine, the Waiters Club. This club has been there for yonks and my memories are of a place where you could get a drink until the early hours despite draconian licensing laws at the time. 2. Bar Americano in Presgrave Pl is reputedly Australia's smallest bar, with a licence to thrill just 10 lucky cocktail addicts. 3. The Croft Institute in Croft Alley is one of the most lively late-night joints, with music to match the bar offerings. 4. Movida is arguably the city's tapas trendsetter, with three locations in Hosier Lane and the most photographed murals (just don't use the word graffiti, please) in the city. 5. Ru Yi, Rice Paper Scissors and SPQR Pizza are all in a laneway oddly named Liverpool St that's always crowded with the trendy set and great value. 6. You'll find Bird's Basement in Singers Lane, behind the Jazz Corner Hotel at the other end of town. This is a terrific new addition to the city's jazz scene, a great performance venue that attracts overseas and local artists. 7. Choose Miznon in Hardware Lane for yummy Israeli street food (try the cauliflower specials). 8. Kirks Wine Bar is also in Hardware Lane. It's like a portal to Rome or Paris. 9. Cherry Bar is in AC/DC Lane, a tribute to the rock group and a legend in its own right for music mostly of the head-banging kind. 10. Market Lane, leading into Melbourne's busy Chinatown, is where you'll be swamped with every kind of Chinese and other Asian eateries, from simple noodle shops to noisy shark fin speciality places. We shouldn't forget the city's 38-year-old, upmarket Chinese establishment, the Flower Drum, for fine Cantonese cuisine.